◾ Free: Anyone who owns a domain name can use Let’s Encrypt to obtain a trusted certificate at zero cost. ◾ Automatic: Software running on a web server can interact with Let’s Encrypt to painlessly obtain a certificate, securely configure it for use, and automatically take care of renewal. ◾ Secure: Let’s Encrypt will serve as a platform for advancing TLS security best practices, both on the CA side and by helping site operators properly secure their servers. ◾ Transparent: All certificates issued or revoked will be publicly recorded and available for anyone to inspect. ◾ Open: The automatic issuance and renewal protocol will be published as an open standard that others can adopt. ◾ Cooperative: Much like the underlying Internet protocols themselves, Let’s Encrypt is a joint effort to benefit the community, beyond the control of any one organization. To benefit fully from this guide I recommend that you learn by practice. Choose Your VPS Plan here at DigitalOcean, or HostGator has quality virtual private server (VPS) server packages. Sign Up for VPS HERE Now! The New HostGator VPS Is Stronger Than Ever! A HostGator VPS is completely customizable and can be upgraded any time as your site grows. Full root access allows you total control, as well as the ability to install advanced software and completely customize your hosting environment. It truly is dedicated functionality without the expense. Download and install git to your system. Let’s Encrypt automatically performs Domain Validation (DV) using a series of challenges. The Certificate Authority (CA) uses challenges to verify the authenticity of your computer’s domain. Once your server is validated, the CA will issue SSL certificates to you. Run Let’s Encrypt with the –standalone parameter. 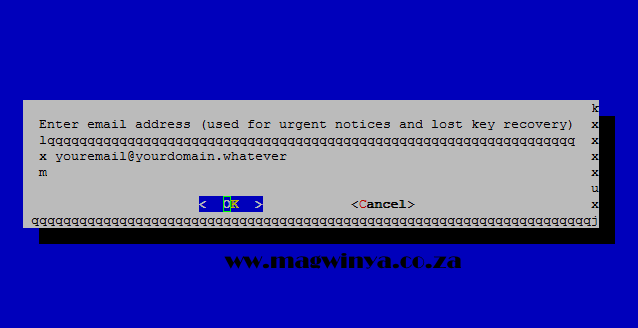 For each additional domain name requiring a certificate, add -d example.com to the end of the command. To obtain a cert I used the Webroot plugin to request an SSL certificate with these commands. Specify an administrative email address. This will allow you to regain control of a lost certificate and receive urgent security notices if necessary. Press TAB followed by ENTER or RETURN to save. Now that you have your certificate up and running, we can go over some basic management commands. Now browse your site and i should be using HTTPS. Renewing a or Multiple Certificates. # For All His eSG NETWORKS - Ubuntu Nginx Web Hosting Servers. # We All Have To Do Something Meaningful In Life. Create a new cron job that will execute the letsencrypt-auto renew. Save and exit: Now every Monday at 2:30 am, the command will run, check and update your SSL certificate. That’s it! 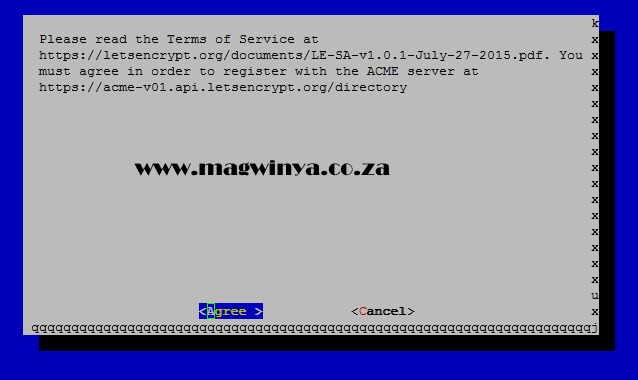 Your web server is now using a free Let’s Encrypt TLS/SSL certificate to securely serve HTTPS content.